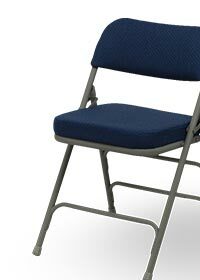 Plastic folding chairs are so lightweight that they’re easy to take along to picnics, parades and parties. Set up tables and plastic folding chairs at your next fundraising event or charity golf tournament for your volunteers to check in guests, sell raffle tickets and collect money. When you’re in the business of setting up, tearing down and hauling around folding chairs, the lighter the chairs, the better. Of course, they must also be strong enough to hold your heaviest guests. Surprisingly strong, many types of plastic folding chairs have been tested to hold 800-1,000 pounds. And when you store them, they take up less space than other folding chairs. Folding Band / Music Chairs, Camouflage Plastic Folding Chairs, Plastic Fan Back Folding Chairs, Plastic Folding Chairs with Built-In Ganging Brackets, Plastic Folding Chairs with Silver or Gray Frame and Kids Plastic Folding Chairs.